Bishōjo (美少女, literally "beautiful girl", also spelled bishoujo) is a Japanese term used to refer to beautiful young girls, usually below young adult age. Bishōjo is not listed as a word in the prominent Japanese dictionary (Kōjien). A variant of the word, biyōjo (美幼女) refers to a beautiful girl before the age of adolescence. 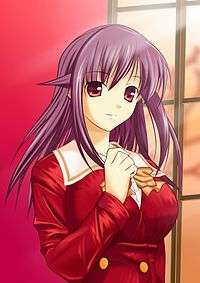 Bishōjo characters are seen in almost all genres of anime and manga, especially in dating sims and visual novels (also known as bishōjo games), and harem anime and manga. It is sometimes confused with the similar-sounding shōjo demographic, but bishōjo refers to the gender and traits of the characters whereas "shōjo" refers to the audience. Although bishōjo is not a genre but a character design, series which predominantly feature such characters, such as harem or visual novels, are sometimes informally called bishōjo series. Since one of the main draws of these series is typically the art and the attractive female characters, the term is occasionally perceived negatively, as a genre which is solely dependent on the marketability of cute characters rather than content or plot. A televised beauty pageant, the Japan Bishojo Contest, has been run since 1985. Singer Aya Ueto first became famous through this contest, at the age of twelve. Model and actress Ryoko Yonekura also won a bishōjo contest in 1992. Look up bishōjo in Wiktionary, the free dictionary.